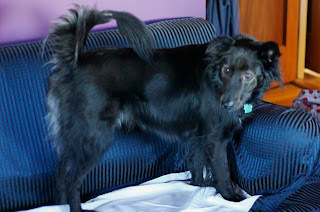 We made a decision not to let Jolly on the furniture in order to keep it clean. This didn't entirely fit in with my visions of bringing home a fluffy rescue who would instantly adore me for my inherent wonderfulness and for giving him a new home and loving environment. I had dreams of us cuddling on the couch watching a movie on a cold winter night, but the real dog that we brought home had other ideas. Both times I tried to get him off of the armchair that he claimed as his own resulted in baring of teeth (on his part) and near tears (on my part). In order to avoid an escalating battle of wills, we started piling random things on the soft surfaces to make them less comfortable. After a year of storing my cookie sheets and cooling racks in the living room, Jolly gave up trying. On our visit home to Brooklyn we learned why. He seems to have determined that the cushions are the problem. The second we took them off the couch at mom's to open the sofa bed, he jumped right up there. If only we had one of these cushionless sofas at home!